Monarch offers flights from a wide range of English airports – Leeds Bradford, Luton, Manchester, Birmingham and Gatwick – to destinations across Europe. Whilst it used to be primarily a charter carrier, it is has refashioned itself into an easyJet-style low cost carrier. You can take a look at their destinations on their website. The standard conversion rate of Clubcard points to Monarch gift vouchers is £1 to £1.50. Until 24th May, this is increased to £2 of Monarch gift vouchers for every £1 of Clubcard vouchers. It is important to understand that you are not converting your points into frequent flyer miles which can be tricky to redeem. 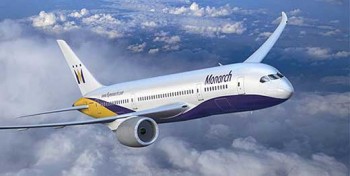 You will be receiving a Monarch e-voucher which can be used to pay for any Monarch flight. The small print is not very restrictive. You will be emailed your voucher immediately and must book and travel by 16th July. You must depart from the UK. The voucher covers extra charges such as baggage fees and extra leg room seats but cannot be used to pay for holiday packages. Full details can be found on the Monarch page of the Tesco Clubcard website here. The Monarch website, for checking out prices and routes, is here.